Home Reviews	Best Car Gun Safe: The Ultimate Guide & Top 5 Picks! If you carry a gun in your car, whether for safety or for sport, you need somewhere safe to keep it. You cannot simply leave a firearm lying around on the dash; it’s not safe for you or for passengers, and in many states it is against the law. A gun is a dangerous item when not in use, but it is also one that you may feel the need to carry, so investing in the best car gun safe for your vehicle isn’t a choice, it’s a must! Also, an exposed gun in a car is a target for thieves. A stolen gun is a problem not just for you but for everyone, so you need to make sure your gun is safe and secure when in the car. Furthermore, if you prefer to carry your gun on your person there will be certain places where you cannot wear a firearm, so you need to leave it in the car, locked away and secure. What you need is a car gun safe. 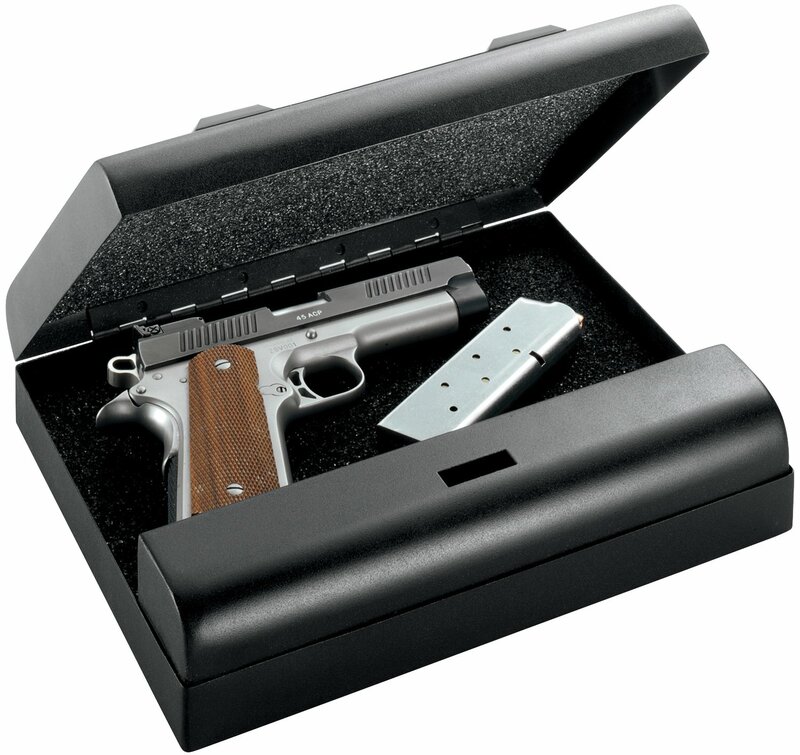 There are many around and they offer an excellent and very secure way of keeping your gun safe at all times. They are not expensive, and can be fitted in places that are also safe and secure – we will talk a little more about that later. So, you want a gun safe for the car; let’s have a look at some more reasons why you need one. 4 Our Top 5 Best Car Gun Safe Picks! Security and safety are the main reasons you need a gun safe for your car or other vehicle. As we have mentioned, certain buildings – think schools, banks and such – do not let you in with a gun on your person. So, you need somewhere to leave it when you are not in the car. A gun safe is the ideal place, and it makes a lot of sense in states where there are laws against exposed firearms. You also need to do all you can to prevent your gun from being stolen. A stolen gun is a danger to everyone, especially if falling into the hands of someone who has ill intentions, and you can end up in very serious trouble if your gun is used illegally by someone else, or found to be the firearm used in a crime. Then there are the children to think about; a gun lying about will always be of interest to curious child. This is why they should never be left unattended in any circumstances. A child could easily injure – or worse – themselves or others picking up an unprotected gun, so your firearms should be locked away when the kids are around. It is against the law to hide a gun in the glove compartment or under the seat; do this, and if the police find your gun, you will be in a lot of trouble. Many state laws insist on guns being in a compartment where they are not immediately accessible by the owner – in other words, a gun safe. Put simply, you need a gun safe in your vehicle so there is no chance at all of someone who is not authorised getting hold of your gun and possibly firing it, whether intentionally or otherwise, and to comply with the laws that are in place regarding carrying guns in vehicles. So, what do you look for when choosing a gun safe for your car? There are many different models on the market, and all have their own attributes, but there are certain things you need to look out for when you are choosing a vehicle gun safe. Size – the size of the gun case you need will be influenced directly by the type of gun you have. A smaller side-arm will not require as big a case as a larger one, of course. You also need to make sure you have space in your vehicle – in an appropriate place – for your gun case. Strength and Structure – there are some gin safes that are budget=price; be aware that they will probably be budget-made, too. Low-end gun safes are not worth buying. They will be relatively easy to break into – especially for someone who has serious intentions and designs on your gun – and will not withstand attack for very long. You are protecting a dangerous weapon here, so you need to buy the very best you can afford. That means thick steel construction – look for 16gauge as a minimum – and sophisticated design intended to prevent being broken open. Spend the most you can afford really is the mantra to follow here. Locks – any viable car gun safe needs to have secure and safe locks, and there are some that offer complex anti-break in designs that are very clever indeed. However, it is not always the case that complexity is the answer. The type of locks you need depends very much on what you are carrying a gun in your car for. If it is for security, then you need quick access; if for transport, a safe and secure gun safe is the best option. Check out the different types and you will see there are many that may be suitable. Check out this video of our #2 pick.. the GunBunker GS-1! Cable Mounting – This type of gun safe is secured by a strong cable, one that has been stress-tested for strength and is as secure as it can be. This method means you have more choice of where your gun safe can go – and it can be made more accessible by relocating – although there are many people who say it is not the most secure method of securing a gun safe. 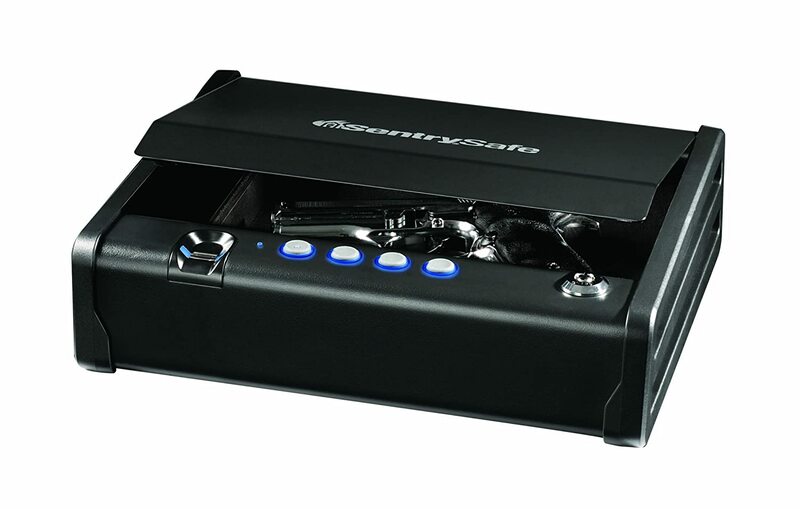 Bolted – You can buy car gun safes that are secured by bolting to the fabric of the vehicle. In many ways, this is the more secure option as it reduces the chances of it being prised away from its mountings. However, it is also limited in where you can site your gun case, and needs more available space. So, now that we know why you need a gun safe, let’s have a look at five of the best on the market right now. Our Top 5 Best Car Gun Safe Picks! Our first choice is this model from GunVault, and it sets the standard as to what a pistol safe for vehicle use should offer. For a start, it’s a simple fuss-free design, so will not stand out too much – you don’t want to advertise your guns after all – and it is a sensible size at around 11×8.5inches with a 2inch depth. It’s neatly designed to fit in even smaller vehicles, and will be unobtrusive. It also comes with a range of interesting features: it has a combination code that can be changed only via a special selection of functions – including a key to unlock then battery power – and has a possible 12million access codes. It is foam lined for internal protection of the items inside, including the gun and any other personal items you may want to store there. This one weighs just 4lbs and is made from very strong and hard to penetrate 20gauge steel, and it is a cable-secured model so you can place it where you want. The cable is stress tested, and it can also be fitted by bolts if required. Overall, a very good car gun safe and at under $90 not bad value at all. 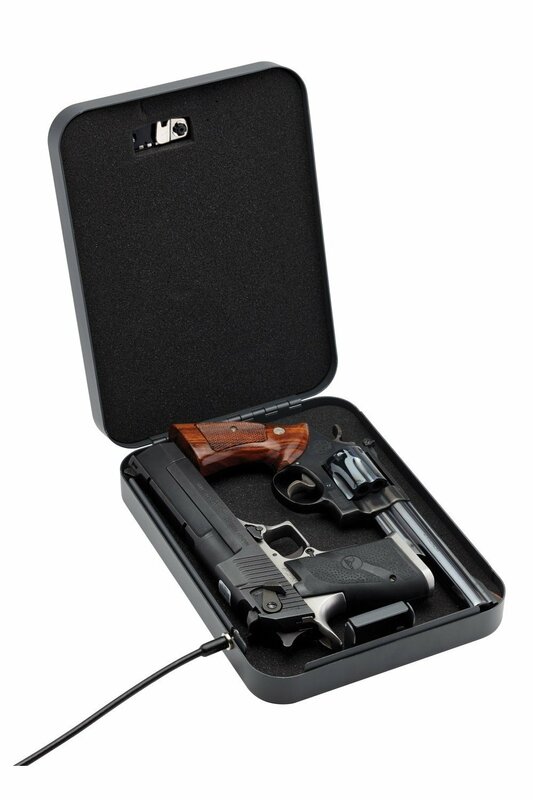 This model is designed to be very compact indeed – it has motorcycle riders in mind as well as cars and other vehicles – and as such is one of the best car gun safe’s on the market. However, the compact size – 8.75×6.5×2.5inches – means that it is suitable only for small pistols. Indeed, it was designed around one of the smaller Glock models, so if your gun measures more than 7.36x5x1.5”, this is not the gun safe for you! 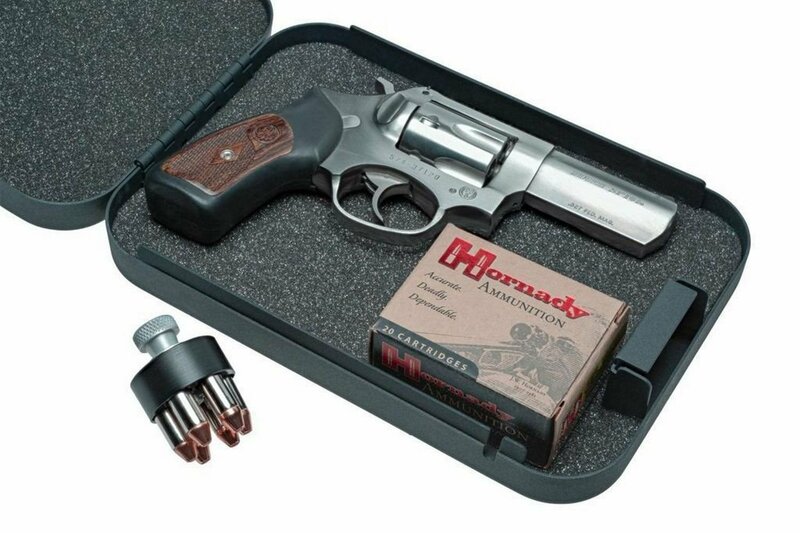 Nevertheless, if you are looking for a very compact model that will house a small pistol, there is a lot recommend this one. It will fit neatly in any space in a car or bike, and it has a simple yet effective double-key locking system. There is no combination so access to the guns can be relatively simple – take this as a plus or a minus depending upon your point of view. The interior of this one is also foam-filled for added protection of the firearms or other valuable items within, and it is supplied with a cable tie system. We have our doubts that this is the strongest cable system, but the overall package meets with TSA requirements. Made from 16gauge steel, this one can be mounted in a variety of different ways, and at about $130 it could be considered a little expensive compared to some. This model is one of the bigger ones on our list, so will fit just about any handgun. It’s a dual combination and key lock model, for added security and protection, and also comes with some impressive credentials that add to its security rating. This one has padding inside so will keep your gun or other valuables clean and safe, and offers scratch protection too. At 10”x 7”x 2” this is a sizeable gun safe, and as it is made from 16gauge durable steel it meets the requirements of many standards for firearms safety. The lock system is by the standard combination dial – not the most secure but one of the easiest to use – and it also comes with pry-resistant features. This one is cable-tied; the cable is guaranteed tested to 1500lb for added security and protection and is one of the strongest there is. However, there is no option to bolt this model without damaging the box itself. It is, however, a popular model with good customer reviews, but we have reservations about its use for handguns given the very simple lock. It can be yours for a quite amazing $20 or less, which also raises suspicion. 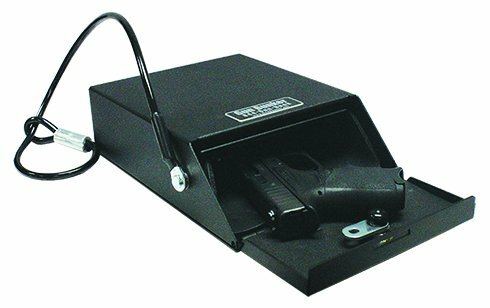 This model is perhaps what most people look for in a secure and effective car gun safe. It’s made to a high standard, is a quality model and comes with some very impressive features. To begin with, it has a very clever biometric access system. In many ways, this is the most secure type you will find, as it means that only the designated user can get into the case. There is also a back-up key lock in case of problems. It’s designed for a single gun and while neat and compact will fit just about any handgun with ease. It comes with very strong solid steel construction and locking points. It has a soft lining for added protection and opens with a gas strut for added security and ease of access, and it also has a prise-resistant door for even greater security. We like the fact it can be had with bolt or cable ties, and it is suitable for use in any car with its compact size. Is there anything we don’t like about this one? Not really as it ticks all the boxes, and as you can buy it for around $110 it is not bad value at all. This pack of two lockboxes sits at the budget end of the market. It’s a key-only version of the other SnapSafe model on our list, and is designed more for the storage of valuables than guns. In fact, we would be reluctant to recommend this one as a gun safe. At 10”x 7”x 2” this is a sizeable gun safe, and as it is made from 16gauge durable steel it meets the requirements of many standards for firearms safety. The lock system is by the standard key – not the most secure but one of the easiest to use – and it also comes with pry-resistant features. This one is cable-tied; the cable is guaranteed tested to 1500lb for added security and protection and is one of the strongest there is. However, there is no option to bolt this model without damaging the box itself. It is, however, a popular model with good customer reviews, but we have reservations about its use for handguns given the very simple lock. This pack of two is available for around $40, so is very good value, but perhaps not for guns. That’s our list of five and, as you can see, there are variations in security and the type of gun safe available. Let’s have a quick summary, and see if we can recommend one that is best for you. Choosing a gun safe for your vehicle is about security and safety in the main, so you need to be careful about the one you pick. We have outlined above the many things that are important – the strength of the casing, the way it is secured, and the size – and we believe that if you read through our reviews and check out the manufacturer instructions, you will find a car gun safe that is right for you. So, which of the above is the best? There are two we like among the five that we believe are worthy of consideration; the first is number one on the list, as it has a 20gauge steel body and a very impressive locking system – and is very sensibly priced – while the other is the fourth one, with the biometric locking system. This one does the job in every area as far as we can see, so is very much one for the shortlist. We can’t recommend either of the two cheaper models as gun safes as they simply do not provide the security required, so check out the better ones, make sure you have a sensible budget, and ensure that your guns are safe when travelling in your vehicle.